Everyone loves stories, especially the stories that are read to them. Here at APH, blind and visually impaired visitors are in awe when they go down to the studio and meet their favorite talking book narrators. 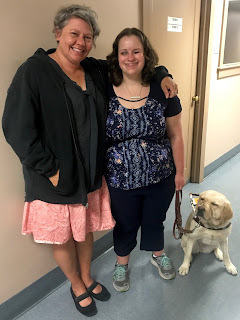 A long-time listener myself, I was given an insider's tour of APH’s talking book studio where I met my favorite reader, Erin Jones. Erin has read many young adult novels including The Hunger Games by Suzanne Collins, the Divergent trilogy by Veronica Roth, and the Bartimaeus trilogy by Jonathan Stroud. Known for her deep, resonant voice, Erin dedicates her time in the studio to capturing the essence of the characters. Meanwhile, Erin paces herself as she reads, pausing to let the details of the setting and the events in the book sink in. For these reasons, I admire her work and was elated to learn the secrets behind her craft. After a few minutes of being tongue-tied and posing for a picture with her, I got down to asking Erin questions about her job as a reader. Interestingly, this career isn’t much different from her past job as an actor. The director of the studio receives new books every two weeks and casts all of the narrators for each book. A reader for 17 years, Erin enjoys books in the young adult and science fiction genres. When asked which titles stood out to her she mentioned The Lost Island of Tamarind by Nadia Aguiar and State of Wonder by Ann Patchett. 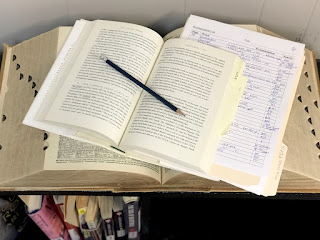 Each book has a set deadline and reading schedule, meaning that Erin could be in the studio as much as two two-hour sessions a day or only one two-hour session a week. Before she comes in to record the first session of a book, she reads ahead, digesting at least half the book’s contents. As she reads, she takes notes about the characters. Composing these notes, Erin says, is essential because as the narrator, a person must be one step ahead of the listener by being familiar with the events of the text and what the characters’ motivations are. This way, Erin can better portray the characters’ thoughts, feelings, and hidden agendas. Additionally, Erin explained that most readers who have a background in acting focus on the dialogue of the text and less on the detail. Unfortunately, this process of reading is not ideal. Concentrating on getting the voices of the characters correct can strain the throat as the pitch and volume of the voice changes with each new character. This is especially true if the narrator is a woman and has to use her voice for five different male characters. Instead, Erin utilizes careful pacing to communicate the intentions of the character as well as the details and events of the story. As Erin continues cracking open books and reading, she does admit that being a narrator has its ups and downs. For example, no one enjoys a book if it is not written well. Unlike the average reader, Erin cannot skim through parts she finds boring or quit after a few chapters. Rather, she must pump herself up to read and hope that the next book is more engaging. On the flip side, when the prose is excellent, the experience of recording and listening to the story is entertaining on both ends, for the reader and listener. Regardless of the time of day or the book she is narrating; Erin is open to meeting her listeners. She likes to know that she’s not speaking into a void, that there are people out there who listen and enjoy her reading. After all, Erin does her job for us, the visually impaired bibliophiles. As such, she loves our dedication to listening and welcomes those who reach out to her. Leaving Erin to get a glass of water and get back to recording, I realize now how lucky I am to have had access to so many free talking books, all recorded by narrators like Erin Jones. Further, being granted the opportunity to interview someone I grew up listening to is even more surreal. Putting my headphones on for another story with her voice, I cannot thank Erin Jones enough for what she does for listeners like me.